The reported arrest of two filmmakers, following the conducting of interviews about a controversial planned golf resort in Aberdeenshire, has been condemned by the National Union of Journalists. Say reports, Anthony Baxter and Richard Phinney had both been arrested and charged with a breach of the peace for conducting interviews for a documentary about a proposed golf resort being built by US real estate tycoon, Donald Trump, at Balmedie, near Aberdeen. They are said to have been detained for four hours by police, during which time they had, among other things, their fingerprints and DNA taken. Their camera equipment is said to have been confiscated for a while, also. The pair are said to have been asking questions about the accidental cutting off of water supplies to local residents. 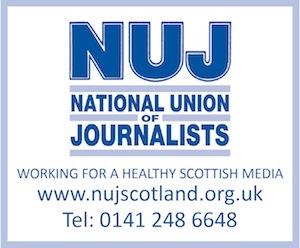 In a statement issued by the NUJ, Paul Holleran the NUJ's Scottish Organiser, is quoted as saying “This is a blatant example of police interference aimed at stopping bona fide journalists from doing their job. They are making a documentary about this controversial development and were made aware that residents had been without water for a week, due to the contractors’ excavations. “Their footage shows they were asking very pertinent questions in a mannerly fashion as befits professional journalists. It then appears Mr O’Connor [Donald Trump's local manager] made a complaint and the police turned up to arrest them. I believe this is a breach of human rights and we are taking legal advice. I think this must be one of the first cases in this country of journalists being arrested for just carrying out interviews to establish the truth and hold people to account.